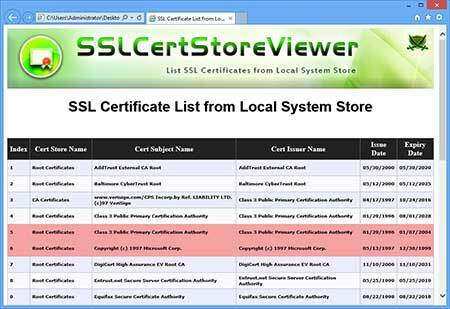 SSL Certificate Store Viewer is the free Tool to view all the installed SSL certificates from your local system store. 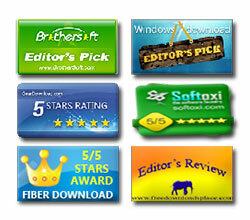 You can also select any certificate and delete it from the store. Finally generate detailed report of displayed certificate list in HTML/XML/TEXT/CSV file. 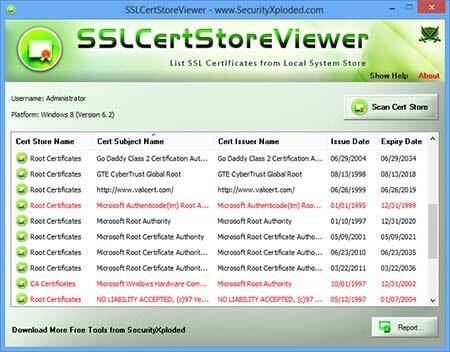 SSL Certificate Store Viewer is fully portable and works on all Windows platforms starting from Windows XP to new Windows 10 version. 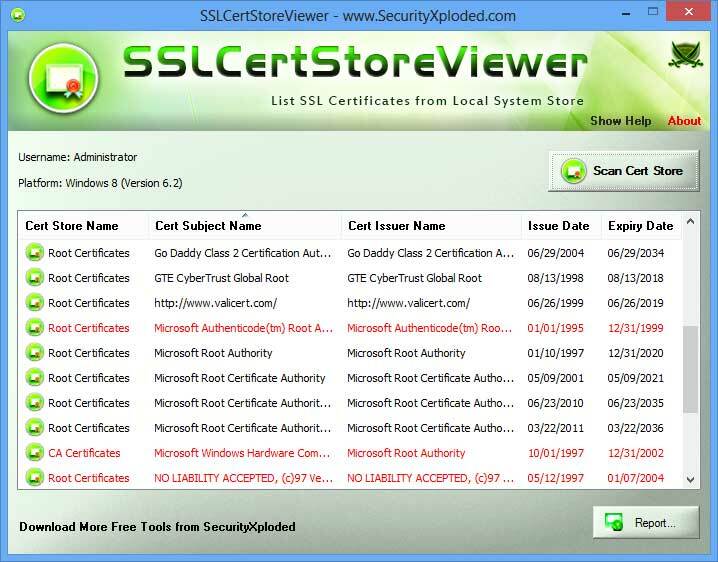 Display Certificates from all the system stores. 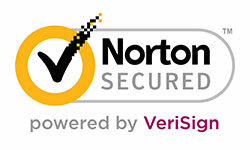 Automatically verify and display the expired certificates in RED color. Generate report in HTML/XML/TEXT/CSV file. SSLCertStoreViewer is a standalone tool and can be run directly from any system. Expired certificates will be displayed in red color. You can also select a certificate and click on 'Delete' button to remove it from the store. Finally you can save all discovered certificate list to HTML/XML/CSV/Text file by clicking on 'Report' button and then select the type of file from the drop down box of 'Save File Dialog'. 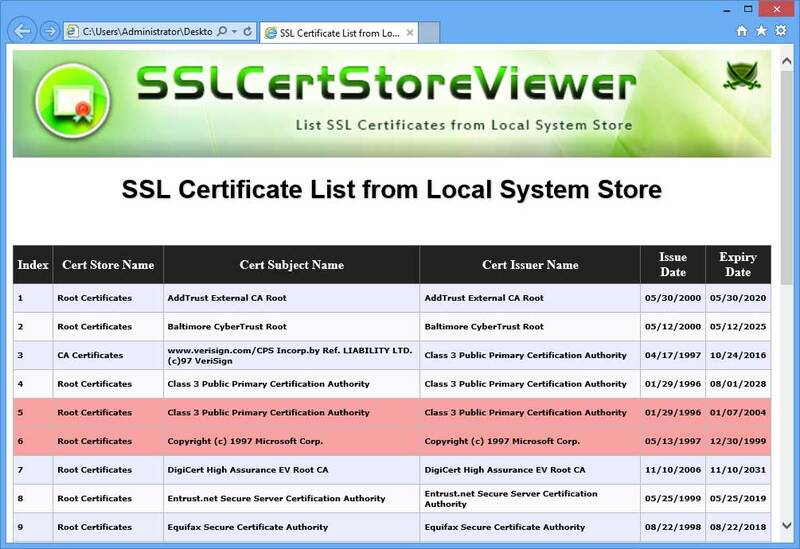 Screenshot 1: SSLCertStoreViewer showing all the installed SSL certificates from local system store. 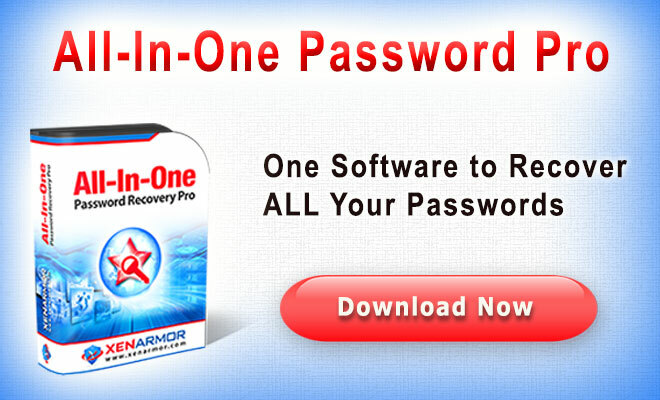 Mega 2016 release with support for new Windows 10 version. Also fixed the resize problem. 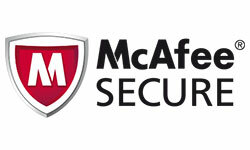 New feature to generate SSL Certificate list in CSV (Comma-Seperated Values) File Format. Improved GUI interface with glowing icon effects. First public release of SSLCertStoreViewer.